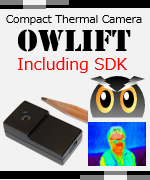 We succeeded in developing a software for the Raspberry Pi that broadcasts thermal video shot by the compact thermal camera OWLIFT. You can see the thermal video when you contact the Raspberry Pi, that is connecting the OWLIFT, from the browser of your PC or smartphone. 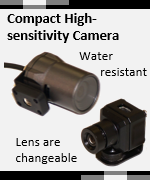 Anyone can use a thermal video broadcasting system inexpensively by adopting our solution. We are planning to release this software in near future.